It is not easy to collect lots of geocache finds in 24 hours, but yet some people have accomplished several hundred in one day. 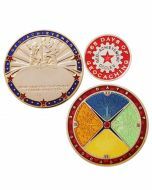 This is a magnificent achievement and this coin is the perfect award for it. Give it as a gift at events, for birthdays, or get one for yourself to display. 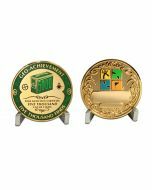 Give this Geo-Achievement® Award to the deserving cacher who has reached a great milestone in cache finds. 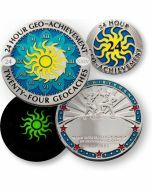 It is not easy to collect lots of geocache finds in 24 hours, but yet some people have accomplished several hundred in one day. 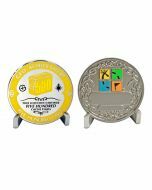 This is a magnificent achievement and this coin is the perfect award for it. Give it as a gift at events, for birthdays, or get one for yourself to display. Includes coin stand and pin.